G. Edward Griffin’s second annual Red Pill Expo began on the Thursday evening, June 21, 2018, prior to the two-day event at the Spokane, (Washington), Convention Center. To launch the conference with a grand and spectacular start, the planners for the Red Pill Expo had decided to launch with a screening of part one of a major documentary film on LaVoy and Jeanette Finicum, their family, and the societal/governmental circumstances surrounding them as ranchers in contemporary America. Mark Herr is the founder of the Center For Self Governance, and is the genius behind the film which premiered at the Red Pill Expo. His perspective is a righteous call for natural justice as the rightful conclusion of a major national tragedy, the assassination of LaVoy Finicum. A great asset in David Herr’s campaign to get the story of LaVoy Finicum out to a mass audience is David Knight, of InfoWars. David Knight hosts David Kerr for about twenty minutes in a must-see video. The following is a segment of a larger production from which the J Grady Channel has extracted just the section featuring David Knight interviewing Mark Kerr about this remarkable film. Enjoy! Personally, I was pleased to see how Mark Herr made sure that Jeanette Finicum had plenty of opportunity in this film to speak naturally, let her direct and honest way of talking carry her message straight from her heart. As does Mark Herr, I also want the world to get a closer look into the spirit and soul which is Jeanette Finicum. She is one of the purest individuals I’ve ever met, is full of her faith in the rightness of life, is the epitome of motherhood and family unity, has the strength of a dozen Sampsons, and loves our American way of life with an unceasing dedication which never falters. 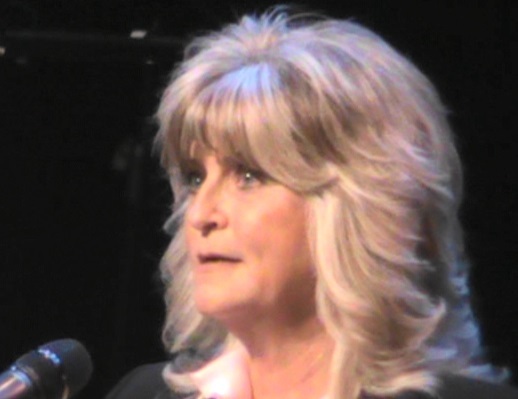 Jeanette Finicum is a model for all of us, yet is as humble and “real” as anyone you’ll meet. Jeanette Finicum truly is, just as LaVoy would want, the extended soul of a Dead Man Talking, but doing so in the visage of a charming, warm-hearted, all-forgiving, brightly sparkling wife of not just LaVoy Finicum, but of also a entire nation which should be properly called “Free America”. As LaVoy died for our freedom, even so Jeanette lives for it. She deserves all the support and respect we together can grant her. And speaking of support and respect, I’m very proud to announce the success of a project The Mental Militia conceived while visiting with Jeanette Finicum at last year’s Red Pill Expo 2017, in Bozeman, Montana. I was so impressed with Mrs. Finicum’s dedication that I volunteered to have The Mental Militia pool together and produce a DVD for her online store. It would be a collage of YouTube videos, featuring some classic LaVoy Finicum videos along with Shawna Cox’s famous footage, the FBI’s footage, and Jeanette’s dynamic closing speech at the 2017 Red Pill Expo in Bozeman. 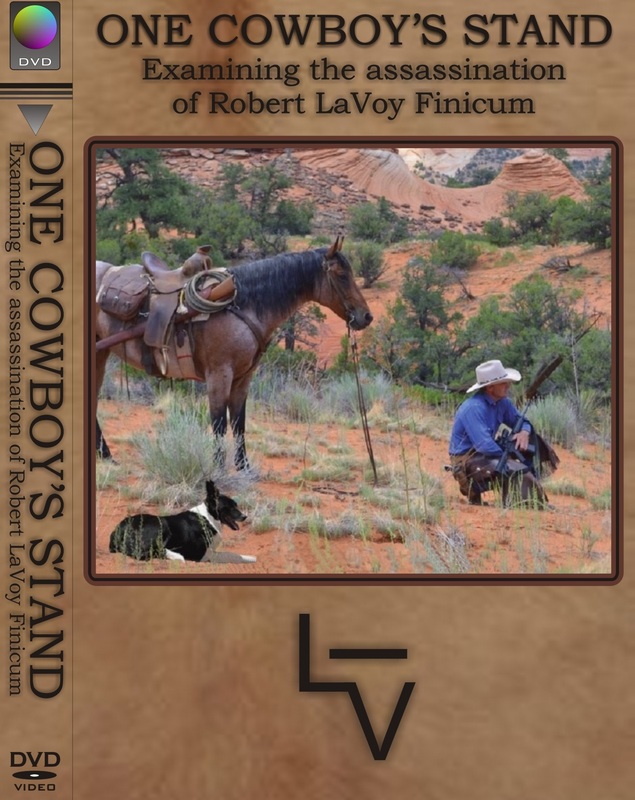 But the DVD I envisioned would be centered with the four “forensic” videos created by Curt Kruse of Montana — videos which pose serious questions regarding LaVoy’s assassination. Jeanette Finicum gave me the go-ahead to create that video, and I put out the call to The Mental Militia, asking for volunteers and donations to fund the cost of producing one hundred videos for the Finicum family’s online store. Adam Ruff and Greg Jednack of California answered the call for hands-on production and other TMMers sent in money to pay for the ink, paper, plastic, blank discs, graphic work, postage, etc. All of TMM wanted to do this for Jeanette Finicum — and I am proud to announce that the DVD we made is now selling at Jeanette Finicum’s website. And to complete my joy, I got to witness Jeanette selling copies of this DVD at her table at the Red Pill Expo 2018. Richard Gage bought one, and Cynthia McKinney bought one, and I’ve no idea who else bought them, but Jeanette sold a goodly number of them at her table. We did it! Mission accomplished. I will add this one small caveat — our DVD is by no means comparable with Mark Herr’s outstanding production, “Dead Man Talking”. His film is a true creative film, while our DVD is only a collection of various YouTube videos. But furnishing the Finicums with one hundred DVDs for selling, we’ve done something to help with her ongoing legal expenses. If a hundred people buy a copy, that will equate to a noteworthy donation courtesy of The Mental Militia. For a small psy-op group such as TMM, that’s something for which all can be proud indeed. And here is yet more good news! Jeanette reported this week that she has already sold more than one-half of the 100 DVDs which TMM is furnishing to her! That is awesome good news, for several reasons. One reason is that more than fifty people now have this DVD which contains the four “forensic” videos created by Curt Kruse of Montana. These forensic-style videos pose powerful questions which all Americans should see. It had been a hectic month just prior to the Expo. I had made two five-thousand-mile round trips by car from northwest Montana to Tennessee. Arriving back in Montana the day before the Red Pill Expo was to begin, I was flat worn out and feeling my age, but there was no time to lament, as there were only a few hours at home before leaving for another trip, this time to Spokane, Washington, to attend the Red Pill Expo. When I arrived, Jeanette Finicum had already arranged her table among all the other exhibitors. I quickly found her and gave her a box of the DVDs which The Mental Militia has made for her. I would like for each of you who sent in donations to make that DVD for the Finicum family to pause right here and pat yourself on the back for helping complete a job well done. I especially want to thank Adam Ruff, who was my “go-to guy” for getting the actual work done in producing that DVD. Adam had previously sent the first batch of DVDs to Jeanette, and she had already added it to her online store (see below for link), but Adam had also shipped another box of DVDs to my address here in Montana, as we had coordinated over the phone while I was traveling, and I hit town here just in time to get that box from the post office before hitting the road to Spokane. So I delivered that new batch of DVDs to Jeanette Finicum’s table on Thursday evening, just before the Red Pill Expo fired up by featuring the screening of the new movie described above, “Dead Man Talking”. Throughout the conference that weekend I was pleased to see that the DVDs were selling at Jeanette’s table. I want to thank every member in, and supporter of, The Mental Militia for a job well done. In a world gone crazy; in a time wracked by governmental insanity and disconnect; in a way many Americans are awakening to in horror, The Mental Militia found some way to humbly assist Jeanette Finicum and her family. While we can’t seem to change the world, we each did what we could do on the domestic scene, and therein rests a secret which flies at the top mast of the Red Pill Expo 2018 — doing something real with which to help our fellow man. The more we do to unite with our good neighbors, the more that wabbling old wicked world can change for the better. I’d like to thank Shari Dovale for doing the camera work in the above video of myself with Jeanette Finicum. I also am pleased to note that Shari has posted the above article at her news website, Redoubt News. Thank you Shari.